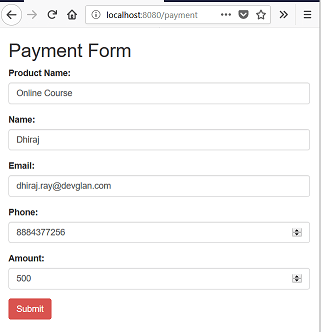 In this article, we will be discussing about payumoney payment gateway integration with spring mvc app. To make our spring MVC configuration simple, we will be generating a spring boot application. For client side, we will be using Thymeleaf along with AngularJS 1 to bind our model object with html. To get started with Payu, first we need to register on the Payu portal to generate a payment key and salt. This payment key and salt will be used to generate hash using SHA-512 hash function while making payment request to Payu. The payment flow which we will be developing here has 3 parts. First, take the user input for product Info, name, email, phone and amount to be paid. Other input field such as success URL, failure URL, Payment Key, Hash, transaction Id will be hidden in the HTML form. Next, create an entry of this user input in our DB. Here, we are using Mysql DB. With these user input, create a unique transaction Id and generate a hash in the server side. 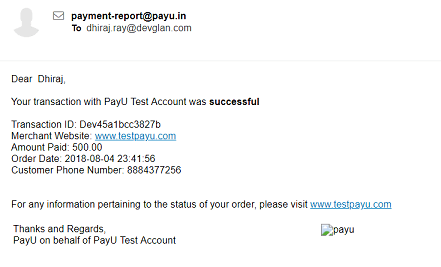 Next, submit the form to //test.payu.in/_payment where user will be asked to enter all the card details and on the successful payment, user will be redirected to a success URL that we had provided during form post to Payu. This will be a POST call from payu with a mihpayid. This will be generated by Payu. Update the transaction as success in our system and redirect user to payment success page. On payment failure, we can redirect user to transaction failed page. For a quick integration guide, you can visit this PayU integration Dev guide. Following is the project structure of the spring boot app that we will be building. Let us first define our controller class. The method viewPaymentPage() will render the payment form where user will provide the details of the payment such as name, email, phone and amount. Similarly, once user clicks on the confirm button, proceedPayment() methd will be excuted. This method will save the payment details in the DB. The method payuCallback() will be a callback method which will be executed as a callback method on the either payment success or failure. Following is the model class to map user input in server side. Similarly, following is the PaymentCallback model class. Now, let us define our service class. Here, proceedPayment() will internally call savePaymentDetail() to save the payment details in the DB and it calls the util method to populate payment related information such as key, hash and other details. Similarly, payuCallback() will check the status and based on that it will update the transaction status in DB. Following is the PaymentUtil.java that has logic to generate the hash and an unique transaction id. While generating hash we need to understand the hash sequence. The sequence is predefined by PayU and it is available on the Dev guide. We are following the same sequence here. PayU also provides provision to add user defined information but since we don't have any user defined terms here the sequence is empty. We are only using compulsory parameters here to make our example simple. Make sure you alo append the salt at the end od the sequence. We have very simple implementation of repository. We have only one method that pulls transaction details based on transaction id. 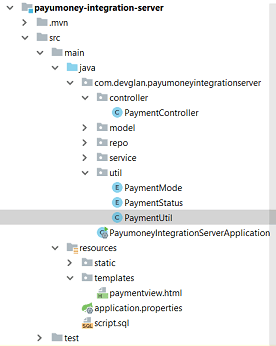 Following is our PayumoneyIntegrationServerApplication.java that will bootstrap our spring boot app. Following is our paymentview.html that has a form to take user input and all the static files import. On the click of confirm button, method defined in angular controller will execute which will make an API request to push the user input transaction details in the DB. On click of the submit button, it will be submitted to //test.payu.in/_payment. As discussed above, we have key, surl,furl, hash are hidden from user and these all are bind with angular model. Following is our Angular implementation of paymentCtrl.js file. It has only one API call. On the success response, the different hidden attributes will be auto populated. You can visit my another article - Spring MVC AngularJS integration to learn about these integrations. 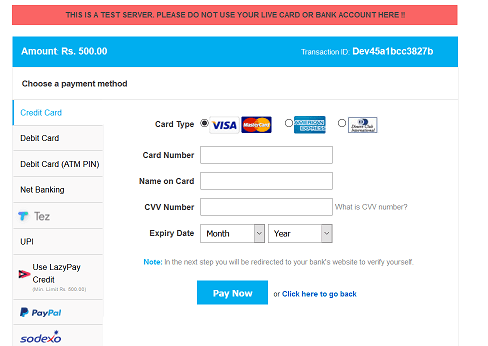 After entering the details, hit submit button and you will be redirected to PayU payment page. Once, the payment is successful, you will be redirected to http://localhost:8080/payment/payment-response and based on the status the DB will be updated. Following is the complete response from PayU. Also, you will receive a notification email about the status of the payment in the mailbox which yo have given on payment page. In this article, we discussed about integrating PayU Money integration with spring MVC and AngularJS. In the next article, we will be discussing about integrating PayU Money with Angular 5 project.